I just have to share some "joy of the moment" with you all. 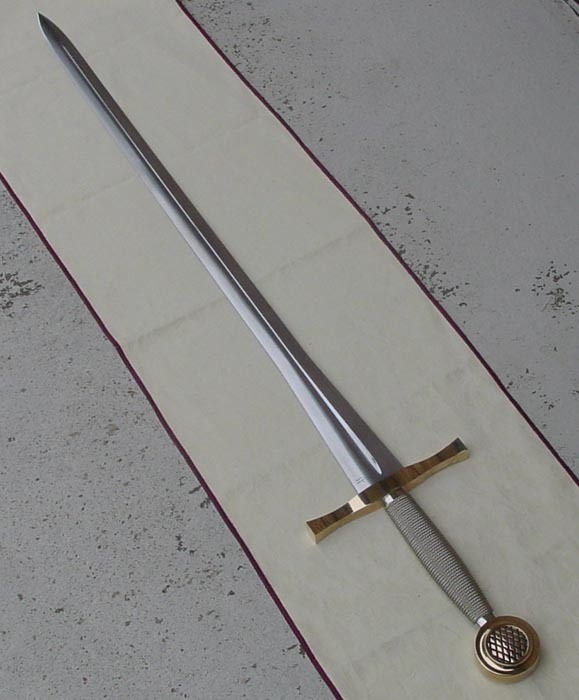 As many of you know, Albion has been working on the Discerner Project, recreating the sword of my family ancestry. 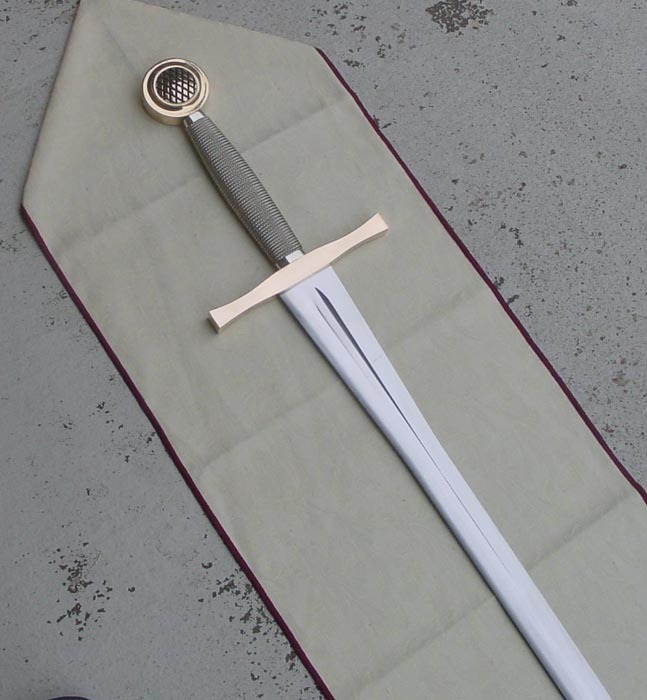 I've felt very honored that Albion is doing this project and extremely proud of the work Albion is doing on the sword ... and I'm thinking that someday in the not-far-off-future, the Limited Editions of Discerner will be arriving at my door. In the meantime, though, I received a long package from Albion yesterday (along with a smaller more squared one). Needless to say that when a long package arrives from Albion it can only be one thing ... a sword! Well, I fell to the task of opening the box with a speed that impressed even my wife. Inside was not one ... but two swords! Discerner Prototype 1 and Discerner Prototype 3 (the Special Edition prototype). And in the smaller package, a beautiful two-sword wooden sword stand. The sentimental value of these two particular swords runs deeper in me than any words I could ever express. I was already very familiar with Prototype 1, having had it for a couple of weeks for inspection and tweaking quite some time ago. As a result, Prototype 2 was born, which rapidly turned into Prototype 3. Though I've seen many photos of Prototype 3 (which turned out to be the final approved sword), yesterday was my first time to see the actual sword itself and hold it. The sword is absolutely perfect and has a feel that is unbelievable. As I drew it from the package, well, I sort of became overwhelmed with lots of emotion and my eyes filled with tears with the joy of the moment and the depth of feeling many many things. As I held it for the first time, I couldn't help but wish that my grandfather was alive today to see this magnificent sword. He'd be so proud of it! All the years and hopes for Discerner to "live" again ... and, now suddenly, it's here! If there were only words enough to express all the emotions and depth of meaning that flood through me! As I sat holding it, a great calm came over me and I guess I was just so excited that I was beyond jumping up and down and carrying on sort of thing. It was a very tranquil excitement with a feeling of ... well, that kind of mild shock that sets in when the culmination of a life-long dream is suddenly realized. I couldn't resist calling Mike at Albion to tell him how wonderful it was ... only I didn't tell him about crying these big crocodile tears full of joy when I pulled the sword from it's packaging. But, *grin* he knows it now as soon as he reads this! Mike, of course, told me that when the sword came to me it was just going to show up on my doorstep ... a surprise package ... and so he let me stew and squirm in pleasant suspense! True to his word, he never told me a thing and then yesterday what a pleasant surprise it was to come home from work and find it waiting for me ... and it couldn't have arrived at a more perfect moment because I'd had the literal day of perdition at work and arrived home feeling down, frustrated and needing a good cheering up ... and, you can be sure the sword did just that! Just had to share my happy moment over Discerner's arrival with all my sword buddies here! And render a most heartfelt "THANKS" and deepest gratitude to Howy, Mike, Eric, Jason and all the wonderful folks at Albion for making the Discerner Project a reality and for bringing a proud piece of my family heritage to life again! Albion, you're the greatest! All my deepest and best regards to all of you. Just a quick pic of my babies here! Will try to get better pics very soon! A big congratulations, Jim. Those are two very beautiful swords you have there. And made even more special due to their connection with your family. I'll bet your grandfather is somewhere smiling right now (I happen to believe in a hereafter). The Discerner is a very impressive sword. Could you post a picture of you holding the prototype 3 for size reference? From what I remember, it's a huge weapon. Hi, Jay! Thanks a million! I'm really happy with Discerner. I believe in a hereafter, too, and I have the same feeling ... that Papaw Lindsey (as we always called him) is up there somewhere beaming with pride and smiling big time. I'm almost through with all the chores that the wife has so generously delegated for me to do, and soon as I'm done with them I'll be happy (and eager) to take some good pics of Discerner with some that include me for a size reference. Discerner is about 44.5" overall length. And what a delight to hold ... I just can't keep my hands off of it ... 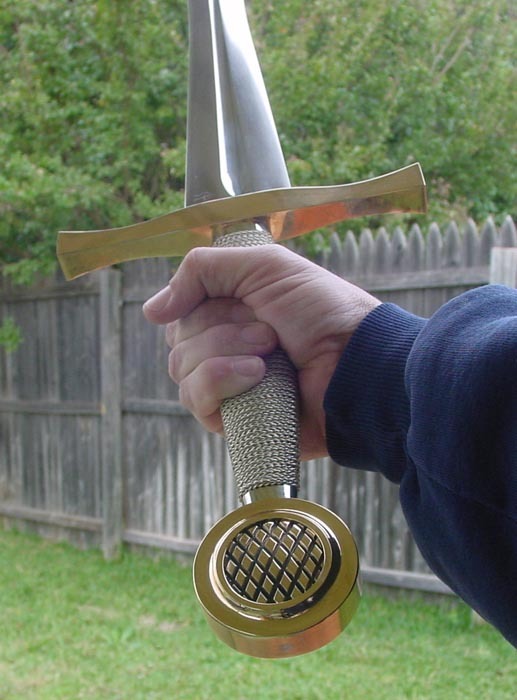 I don't know the scientifics about sword balance, but Discerner is unlike any sword I've ever held before. It just "feels so right" in every respect. She's really a fine piece of workmanship! And, Jason did the blade so well ... I just can't get over the blade. He did an absolutely astounding job on it. He's really got a great talent. And the grip wrapping that Albion did for the Special Edition is sooooooo comfortable as well as beautiful! I'm very impressed big time. I already knew it was going to come out extremely well, but nothing could have prepared me for how truly magnificent it would actually be. Well, it's almost bedtime so I'm going to admire them for a little while then it's off to bed for some good sleep. I'll try to get some really good pics posted tomorrow for you. Thanks again, Jay, and have a great evening. Slainté! i have been watching this story from the get go,and it has really amazed me. it was really great of Albion to take on this project and honor you. By the way, thats a really cool display ya got there.......... I like how the atlantean box doubles as a nice display! Like a lot of folks, I've been following the Discerner story for some time. It's great that it's now complete. It must feel like the wheels of time have come full circle. It must be absolutely wonderful to hold a piece of your family history, recreated with the care and attention to detail of all the artisans of Albion. It amazes me how something that appears to be rather simple on the surface can carry such profound symbolism within it, from the crosshatch design on the face of the pommel to the significance of the braiding of the wire that covers the grip. Thanks to you and Abion, for showing us how a brilliant example of how form and function can be combined into something greater than the sum of its parts. Thanks, David, Keith and Robert, for all of your excellent congrats! It really does feel remarkable to be holding a piece of my family history recreated with such excellence and detail. There's a fulfilling feeling about it all. And, like Keith said, it's like the wheel of time has come full circle ... only with a new door opening a fresh new chapter in family history. Albion has a wonderful way of bringing things together and making dreams come true for so many people. The folks at Albion are, in my book, the greatest! The literal tender loving care that they give to each piece of work they make for each project is always amazing to me. I look at the photos of all their products and literally drool seeing the quality that's evident in each piece. I've literally been on Cloud 9 since the swords arrived. I think I'll be walking around in a pleasant haze for days with all these good happenings. To all the folks at Albion, my hat's off to you all for a job well done ... I always knew the sword would be wonderful, but this beautiful masterpiece that I hold in my hand just blows me away and far exceeds my wildest expectations. Salute! And, thank you most graciously from the deepest regions of my heart. Hi, guys ... Just another quick picture of my "baby" here. Tomorrow, when it's brighter outside, I'll try to get some good outdoor pics of Discerner. I've tried several angles and the flash just glares like crazy, so I think my best bet at some really good photos might be outdoors in "natural" light. But, here's a quick full length shot. Besides the size of the crosshatched section of the pommel what is the difference between the first and third prototype? Congratulations Jim. It's a great feeling to see a project all the way through to fruition, especially one with family ties like this one. Hi, Jay! The differences between Prototype 1 and Prototype 3 are pretty minor in a lot of respects, but when the two swords are seen together, are readily apparent. Prototype 1 is, in its own right, a very beautiful sword. I really like it and feel a strong connection of sentimentality toward it as it is the very first "incarnation" of Discerner since the original sword was buried with my ancestor in 1683. Discerner's recreation has been a fascinating adventure because the entire beginning of the project (especially up to the creation of Prototype 1) was done through tons of phone calls as well as email descriptions and drawings. The end result was Prototype 1 which was extremely close, but because we had not yet been able to go by the full sized tracing of the sword (which at the time was still in my mother's old cedar chest in the safekeeping of my sister), there were some minor design differences in several areas. These included some blade geometry, pommel thickness and diamond insert details, grip shape and thickness, ferrules and guard thickness. In fact, Prototype 1 was so very close to being exactly right that I have always considered it to be a successful and remarkable first attempt at recreating Discerner. When I brought the design differences to Albion's attention, they enthusiastically launched into Prototype 2 in which they nailed the blade design, guard and ferruls with absolute perfection. In fact, the only inaccuracies that remained in Prototype 2 were in the areas of the pommel and grip. True to Albion's penchant for being 100% accurate, they immediately made the requested changes in the grip and pommel, thus Prototype 2 became Prototype 3 ... the final and perfectly recreated design. I've included a photo for you, Jay ... it's Prototype 1 and 3 side by side. As you can see, they're pretty close! The folks at Albion have been so wonderful throughout the entire project. Whenever I'd point out a correction to the design, they were always patient with me and would enthusiastically make the correction ... and in short order the end result is a beautiful and accurate recreation of a cherished family heirloom that would do my ancestors proud. I think I can best express it like I did once in an earlier email ... if I were to say "Thank You" a thousand times a thousand, it would never be enough to express my gratitude and sincere respect for Albion in this project. Their patience, diligence and attention to detail has been exemplary and throughout the project they've become like long-time friends that I've known all my life. I just can't get over the thrill of these swords being here. 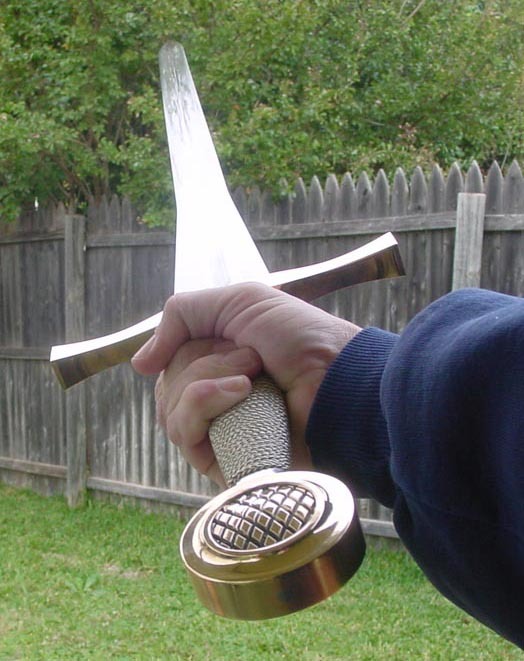 I remember feeling the thrill of reading about Mac's wonderful claymore by Vince Evans, Patrick's beautiful "Big Johnsson" sword, and the myriad of other posts by people who've acquired a sword they really love and admire (I love reading about people getting swords that they really admire and makes them happy) ... now here I am making my own such posts and feeling a happiness that I really can't find adequate words for. Thanks, Patrick! I sure appreciate it. And, I'm definitely having some happy days right now ... I can imagine how I'm going to zone out when my Limiteds come in! By the way, I haven't forgotten the Liberal KS pics, just haven't found them yet! Take care and have a great day and thanks again! Hi Everyone! I just came in from taking some outdoor pics of Discerner. Hope you like them ... they show much more detail of the sword than my previous few pics. 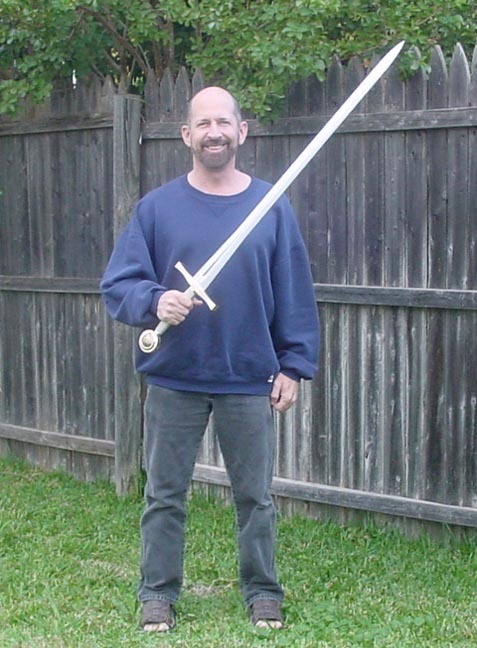 And, Jay, if you're reading this, I'm starting out with a pic of me holding the sword so you can get an idea of size and scale. Standing barefoot, I'm 5'5" tall. 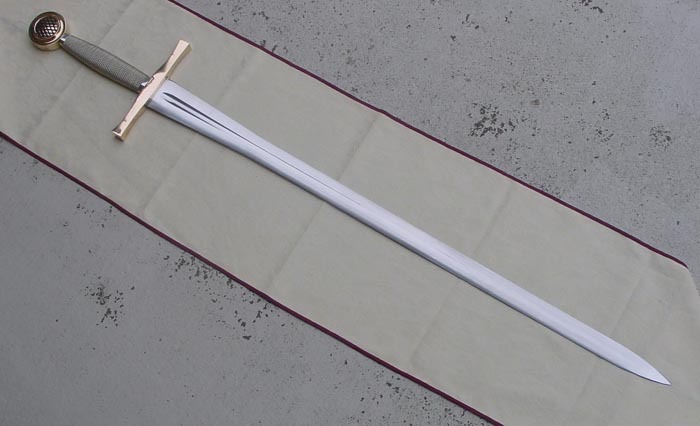 The sword is 44.5" overall length. The appearance of the sword is very deceiving ... it looks like it'd be pretty heavy until you pick it up ... and it's so light and well balanced it seems to literally fly into your hand. The Albion folks really did a wonderful job on it. I took pics from several angles of the sword so there's going to be a few of them, but I saved them at relatively low file sizes, so they shouldn't take up much room. Since I don't exactly know how many pics can go into just a single post, I'm only going to throw one or two in each one. All of the pics were taken outside on a very nice gloomy day, but even with the Special Edition's more satin-polished blade, I still had to work a bit to get good shots without glare. The Limiteds will have fully high polished blades (like on Prototype 1), so, they're going to be even more beautiful but really tricky to photograph. That's a great shot, Jim. Even though the sword is quite large, it's perfectly proportioned. It's about twenty degrees here in Maine right now so I can barely remember what it's like to wear sandals! Thanks, Jay! Yeah, we're having some cool but mild weather here. When I was making my living playing music we did a few shows up in Maine (I believe the town was called Skowhegan, but I'm not sure how it's spelled). It was great in the summer, but I remember doing a November show up there and it was really cold! Last, but absolutely not least, is a full shot of the sword in bend dexter, point up ... this one shows the fuller very well in its entirety. Posted: Sat 15 Nov, 2003 1:35 pm Post subject: Nice Swords, Jim. Wow, that discerner has a lot more size to it than I thought. I like the overall appearance of the sword, very nice. From where I'm sitting, it looks like the folks at Albion did one crisp job. I cannot see any flaws in the furniture detail or anything. Congratulations on a beautiful weapon to all involved.